This was a lot funnier until I saw the game-time temperature at Wrigley was 43 degrees. 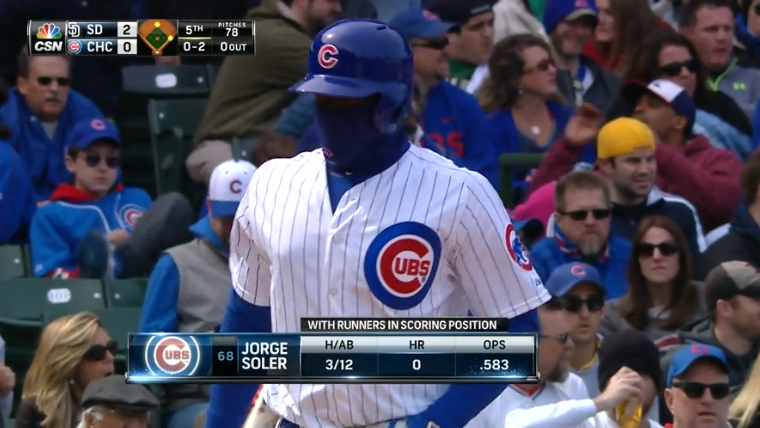 Still, by looking at Soler today you would have thought the Cubs were playing in 12 degree weather with some windchill. This kid is from Havana, Cuba; where those tobacco fields he grew up playing on hit 88 on a cool day. This was a magical little matinee for the Cubbies, where Kris Bryant was on base five times and collected his first big league hit. He got another key infield hit in the bottom of the 11th off Craig Kimbrel to keep the line moving. Cubbies walk-off with a win 7-6 in a game they blew a 6-2 lead in the top of the ninth. The winning hit came on a Starlin Castro single to left field. Anthony Rizzo stole two bases; baseball is odd. The cold Soler went 1 for 6. He just wasn’t comfortable today out there. Now he can head across the street and rob the nearest convenience store.